Better late than never, here’s the report of the rest of the canal trip. Select photos are now available on line at my gallery. The morning of day two we awoke to a frozen canal. This branch of the Shropshire Union canal had little traffic as it was the route between the main part of the Shropshire Union and the Trent and Mersey canal. You only use it if you want to get from one to the other. But this cold morning we were not the first people moving and another boat kindly broke the ice for us. Called “The Original Fudge Boat” it also had “Sanity?” written on the back. I have to admit agreed with the question given the weather. Eventually, after a hearty breakfast, we go going ourselves. Steering a boat through the ice isn’t easy. The ice wants to push the boat in all sorts of directions. This is especially true for the large sheets which hadn’t broken up as they would bounce back off of the river back and knock the boat. The cold winter scenery though was truly beautiful. We continued on the branch of the Shropshire Union before passing through the final lock and small bridge that put us on to the Trent and Mersey at Middlewich. At Middlewich we stopped in to The Kings Locks pub and grabbed a great pub lunch and a couple of pints which set us up nicely for the rest of the day. 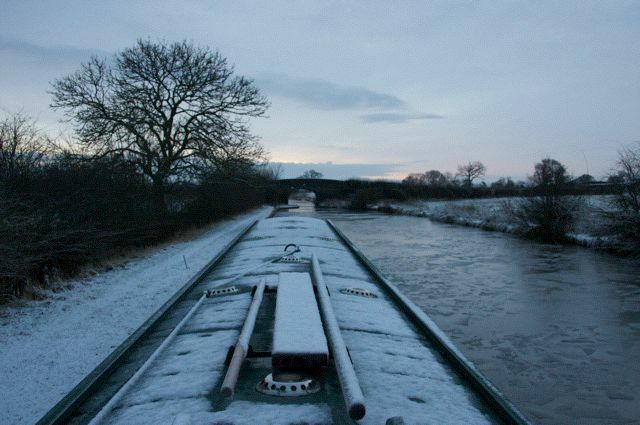 From Middlewich we headed north towards Northwich stopping when it got dark. The following day we continued up around Northwich to see the Anderton Boat Lift. This is a fantastic Victorian contrivance which was built to raise and lower canal boats between the Trent and Mersey canal and the Weaver Navigation, some 50 feet below. It has two huge troughs each of which can carry two boats. These troughs, complete with water, transfer the boats between the two water ways. Originally it used hydrolic pistons to raise and lower the troughs but it was converted to cable hoists a while after construction. We didn’t get to see it working unfortunately but it looked fantastic. As I was leaving the boat the following lunch time we finished heading north at this point and turned around. We grabbed another pub lunch on route hitting Middlewich at dusk and as there was no where to stop we were a little naughty and got through the final locks and back on to the Shropshire Union in the dark. The following morning, as I had done the day before, I got the boat going while the others stayed in bed. It was very relaxing to potter along the canals with no one else around. Over the few days my boat handling skills came back and I was quite happy, for example, to go reclaim the boat and collect the others from the canal side at by the pub. Finally around 2pm we got back to the boat yard where I left the others. They continued on and I drove home some what chilled out. I have take a few days off to join Molly and Kim on a British narrow boat aka a canal boat. Doing this in the middle of winter is probably not the best time and yes it’s cold but the countryside is beautiful. The waterways in Britain were the first form of mass transit in the islands and were built in the seventeenth, eighteenth and early nineteenth centuries before being superceded by the railways. They were used for goods transport until the sixties and recently one of the big chain stores has started using them again to transport non perishable goods as it’s an extremely cheap for of transport. Originally the horse was the motive power. One would be lead along the path by the side of the canal towing the boat. The exception being tunnels where the narrowboat men would walk the boat by laying on boards on the boat and pushing it with their feet against the tunnel wall. Now the ubiquitous marine diesel is used. As the canals went out of favour many were left abandoned and some were filled in. But some converted the old barges in to homes. Canal boating became popular as a past time, a vacation activity and for some an alternative lifestyle. In the last couple of decades canals have been restored and rebuilt. Even some new ones have been built. There is a network of them all over Britain. Our boat is typical of a holiday boat and a narrow boat in general. It’s about two metres wide, the widest you can get in a lock, and about thirteen metres long. Ours is actually custom built as there are several boat builders who make brand new traditional steel hulled boats. The canal is quiet at this time of year. We’re currently ice breaking as we travel as we’re the first boat along this section. But there are people on it. Some live on it all year around and some have boats to escape everyday life. Everyone is friendly. I met this awesome hippy woman who had a long boat with a trailer. The front was a craft shop where she sold her wares and the back was her home. 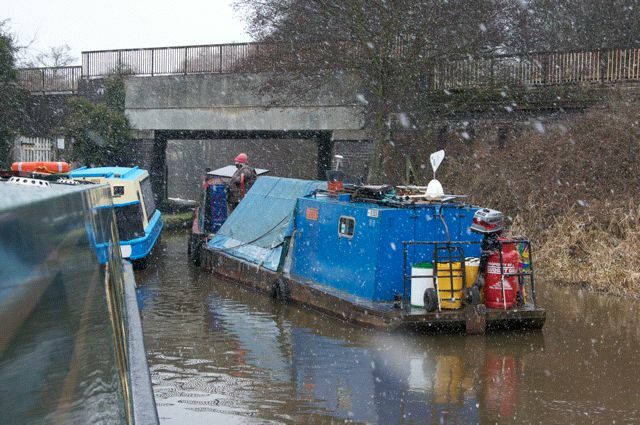 The vacation didn’t have an auspicious start with snow but we left the boat yard and travelled through the first lock staircase before mooring up away from people. It was an early night and an early start. Engine on to warn the boat and then we had breakfast. We had a couple of sets of locks to tackle but now we have quite away with none. I’m finding this very relaxing. You can’t be hurried when your top speed is walking pace and the only activity is the relatively physical activity of passing through a lock. It’s very pleasant!